Dempsey Dyer, one of the UK’s most accredited, quality conscious fabricators, has adopted BSI standards across the board after a period of using several different schemes. 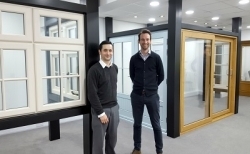 The firm is now able to supply products that meet BS644 for enhanced security timber windows and doors, BS7412 for enhanced security uPVC windows and doors, and BS 8529 for enhanced security composite doors. Dempsey Dyer continues to comply with ISO 901:2008, which covers the manufacture of uPVC windows, doors and conservatories, and is registered with the British Fenestration Rating Council. “We’ve taken this decision to streamline our processes and make life simpler for our customers,” commented Mark Suaznabar, Dempsey Dyer compliance and quality manager.